The Vocal Art Ensemble of Sweden was previously known as Kammarkören Pro Musica; their present name was adopted in 2013 when the choir marked its 35th anniversary. Jan Yngwe has been the group’s conductor since 1978 so I presume he was the founding conductor. I think this is the first time that one of their discs has come to us for review. They comprise 41 singers (11/11/9/10). This is an uncommonly enterprising and wide-ranging programme, offering music by composers from many nations and backgrounds. As we shall see, some of the pieces unashamedly address political issues. Quite a number of the composers may be unfamiliar to readers, as they were to me. I’ll start with those composers whose music was either unfamiliar or unknown to me. The Swede, Sven-David Sandström’s setting of four lines by William Blake is a very impressive piece. It begins and ends quietly but achieves an imposing cenral climax. The vocal writing is very convincing. The Taiwanese-American, Vienna Tang is one of those who addresses an issue of our time – the potential for intrusion into our privacy by information companies – in her song, The Hymn of Acxiom. Heard here in an arrangement made for the choir by Henrik Dahlgren I’m afraid neither the words nor the music did much for me despite the artistry of Jan Yngwe and his singers. The pieces by Yngwe himself and by his fellow Swede, Ulrika Emanuelsson, were both written for this choir and for the two percussionists, Daniel Berg and Fredrik Duyling, who comprise the Rhythm Art Duo. Both pieces fall into what I might term the “political segment” of this programme. Yngwe sets words from Martin Luther King’s inspirational “I have a dream” speech while Emanuelsson sets some words by the Swedish former UN Secretary-General, Dag Hammarskjöld (1905-1961). Of the two pieces my personal preference is for the Emanuelsson, which is sung in Swedish. The choral writing is more conventional than is the case with Yngwe’s piece and the percussion is used most effectively to augment and colour the textures. 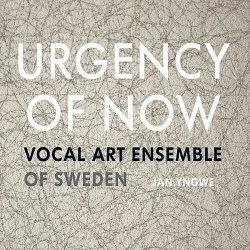 Yngwe’s offering, which is sung in English, is more experimental in the sense that quite a wide variety of vocal techniques are deployed; not all of them are helpful, it seems to me, in illuminating the text. The percussion is used in some very interesting ways and Yngwe uses a wider range of instruments than does Emanuelsson. I found I respected Yngwe’s piece but I can’t say I was moved by it. César Alejandro Carillo is a Venezuelan composer. Bearing in mind his Latin American heritage and the description of his Magnificat in the booklet as “a musical celebration of the circle of life” I was expecting a vibrant, extrovert piece. In fact his setting is quite restrained and thoughtful. I liked it very much. Not the least impressive passage occurs when a soprano soloist sings the words “Quia facet mich magna” His fellow Latin composer, Calixto Alvarez is Cuban. His Lacrimosa is an interesting composition in which the male voices sing the Latin words from the end of the Dies Irae against a keening soprano line, mainly sung by a soloist. We’re told that the soprano part is “a moving prayer for better living conditions in an African Yoruba dialect.” My only regret is that a translation of the African words is not provided so that we can judge even better the impact of what is clearly a most eloquent piece. The notes say that in this piece “two worlds converge” and that’s right; the composer’s skill is such that the worlds converge rather than collide. In De profundis by the Filipino composer, John August Pamintuan the basses sing the two Latin words of the title over and over while the female voices, later joined by the tenors, sing an agitated, teeming setting of words by Lorca. This is an arresting piece and it’s stunningly performed. Unfortunately, I can’t summon up as much – or indeed any – enthusiasm for Hide and Seek, a song by the British singer/songwriter, Imogen Heap. The words, I imagine, are her own. We read in the notes that the song is about the treatment of indigenous people. I’m glad we had that explanation for, frankly, it’s well-nigh impossible to discern that from reading the words. Despite the advocacy that it receives here Heap’s piece strikes me as being pretty thin gruel. Ravel and Barber are much better known composers. I’ve never felt that Barber’s own choral arrangement of his celebrated Adagio for Strings works, not least because the singers can sound strained by Barber’s eventually very high-lying lines. However, this superb performance by Vocal Art Ensemble is extremely persuasive of the merits of Barber’s arrangement. I admire enormously the control which these Swedish singers exert, both when the music is loud or soft. The French composer Thierry Machuel has arranged Ravel’s Le jardin féérique for voices, setting the music to words by Benoît Richter. I’m afraid this attempt to reimagine Ravel’s magical piece just doesn’t work at all for me and that’s no reflection on the singers here. Right from the start I missed the gorgeous, subtle textures of Ravel’s orchestration and all the many colours in which Ravel paints his picture of the enchanted garden. Right after playing this arrangement I listened to a recording of the orchestral version to remind myself of what I’d been missing. In order to be fair to Machuel I also listened to a recording of Ravel’s original version for two pianos; even though there isn’t the same palette of colours in the piano version I still prefer it to Machuel’s effort. I felt that one problem with this vocal performance is that Jan Yngwe takes the music too swiftly, thereby missing some of the poetry. Interestingly, the piano version that I played, by Pascal and Denise-Françoise Rogé, takes almost exactly as long as Yngwe’s performance but it doesn’t feel as fast. I doubt I’ll want to hear Machuel’s arrangement again. The programme begins and ends with pieces by the Latvian, Ēriks Ešenvalds. I’ve heard all three before, including as part of a fine all-Ešenvalds disc that I reviewed last year. I think that Ešenvalds is a most interesting composer with a fabulous ear for imaginative textures. Jan Yngwe has chosen three pieces that show him at his best. O salutaris hostia is an utterly gorgeous piece. It includes testing parts for two soprano soloists. The two soloists here, Josefin Lidén and Madelene Johansson, are superb, their pure, clear voices a treat for the ears. The only slight caveat I’d enter is that other performances I’ve heard – both live and on disc – have placed the soloists at a bit more of a distance than is the case here. It’s still a wonderful performance, though. The other two pieces are settings in English of words by Sara Teasdale. The choir demonstrates terrific attack at the start of The New Moon while in the third and final stanza, where the music relaxes as the mood of the poem becomes more reflective, the choir’s sound is warm and sensitive. In this closing section Ešenvalds gently enriches his textures by adding a glockenspiel and water-tuned glasses, the latter played by members of the choir. The effect is beguiling. He uses the glasses again in Stars. Here the glasses are used to create a very beautiful, gentle halo of sound around the voices. This aura of sound, coupled with exquisite vocal writing creates an effect that is utterly magical. It’s a gently radiant piece and the performance here is unforgettable. I have reservations about some of the repertoire in this programme though others may well disagree with my subjective view. What I hope there will be no disagreement about is the quality of the performances. This is, quite simply, 61 minutes of outstanding singing. This is an expert choir who blend together wonderfully and who create a sound that consistently delights the ear. Several solo parts are taken by choir members and without exception these solos are expertly sung. All praise to them, too, for promoting contemporary choral music in such a committed fashion. They’ve been most sensitively recorded by Per Sjösten in what sounds like a lovely acoustic. As I said, I think this is the first time that a disc by this choir has been reviewed on MusicWeb International; I hope it won’t be the last.